The Navitimer is easily the most recognizable Breitling in the manufacture’s illustrious history. It has been a favorite of pilots and posers since 1952. If anything, the brand was a victim of their own earned success. In truth, the Navitimer is a very credible and well-designed piece. 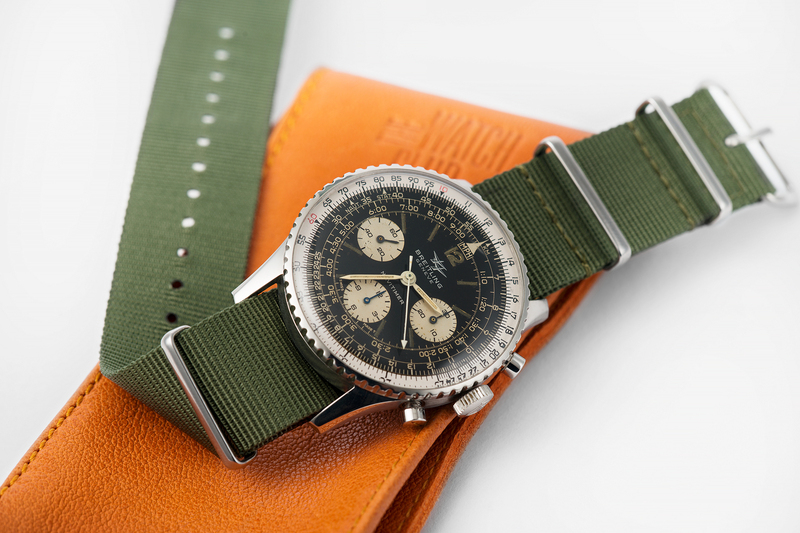 The Breitling 806’s dial was the first to incorporate a slide rule that could logarithmically calculate milage, kilometers, and nautical miles. It was first released with a AOPA (Aircraft Owners and Pilots Association) logo, not Breitling’s own. Halfway through the production, it was changed back to Breitling and the ‘Twin Planes’ we see here. The movement was a manually-wound column wheel Venus 178. For whatever reason, in 1954 only, the 806 was produced with a Valjoux 72. Collectors love these. But this humble later-first execution example I find myself very drawn to. Despite the fact that the case has been polished, the rest is very lovely. The Venus 178, perhaps most importantly, is hardly corroded. Its tritium has aged particularly well. The registers are lightly champagned, with all fonts still strong. It’s not the most desirable, rarest, or most well-kept example around. But it is a well-preserved and quite reasonable example of an iconic bit of Breitling’s past. It would certainly ease my conscience to purchase an 806 from a known entity, as well-executed fakes are about as common in circulation as the real thing. With all that it mind, I leave this 806 to your judgement. Find it here for 5320 GBP.